City of southern France. Jews settled there in the fourth century, and, as in the other Gallic cities along the coast of the Mediterranean, were the intermediaries in the commercial transactions between the Levant and Gaul. The statutes of Nice, enacted in 1341, obliged the Jews to weara badge under penalty, in case of disobedience, of forfeiting one-half of their garments to the informer, and the other half to the city council. In 1430 Duke Amédée, while still obliging them to wear their distinctive badge, granted them permission to become money-lenders and pawnbrokers on payment of an annual tribute ("garda Judeorum") of a silver mark. In 1613 the Jews of Nice gave 2,000 ducats, and in 1614 400 additional, to Duke Emanuel I., who exempted them from all extraordinary taxation. Special privileges were decreed to foreign Jews in 1650 and 1673; they were authorized to engage in commerce without molestation in the cities of Nice and Villefranche. For twenty-five years they enjoyed entire liberty in the practise of their religion; and it was forbidden to arrest them on their Sabbath or on festival days. In 1658 the Senate placed the Jews of Nice on an equal footing with those of Turin, but without allowing them a special slaughter-house. It permitted them to own houses for their personal use, and to employ Christians provided the latter, with the exception of nurses during the eight days following childbirth, did not actually lodge with them. It forbade them, however, to devote themselves to the study of medicine or jurisprudence, at least, as far as medicine was concerned, without ecclesiastical sanction. In 1750 Jews were permitted to discard the badge, and in 1777 a royal decree authorized David Moses, a Jew, to build a silk-factory near the harbor. 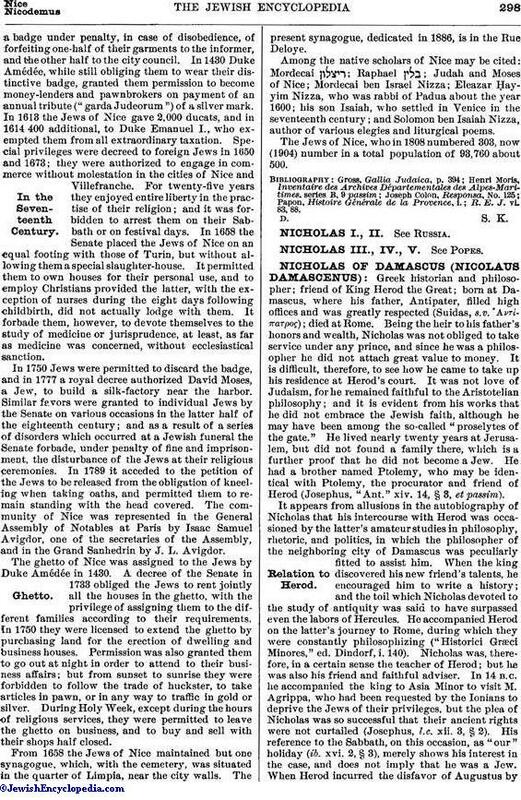 Similar favors were granted to individual Jews by the Senate on various occasions in the latter half of the eighteenth century; and as a result of a series of disorders which occurred at a Jewish funeral the Senate forbade, under penalty of fine and imprisonment, the disturbance of the Jews at their religious ceremonies. In 1789 it acceded to the petition of the Jews to be released from the obligation of kneeling when taking oaths, and permitted them to remain standing with the head covered. 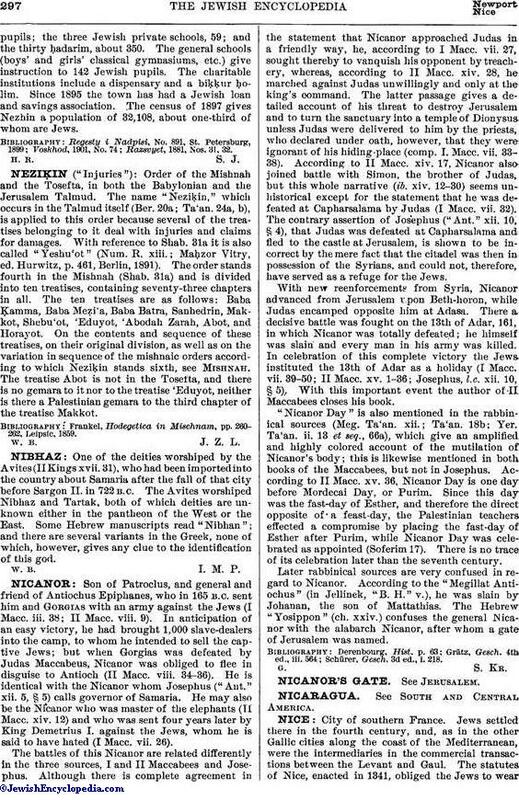 The community of Nice was represented in the General Assembly of Notables at Paris by Isaac Samuel Avigdor, one of the secretaries of the Assembly, and in the Grand Sanhedrin by J. L. Avigdor. The ghetto of Nice was assigned to the Jews by Duke Amédée in 1430. A decree of the Senate in 1733 obliged the Jews to rent jointly all the houses in the ghetto, with the privilege of assigning them to the different families according to their requirements. In 1750 they were licensed to extend the ghetto by purchasing land for the erection of dwelling and business houses. Permission was also granted them to go out at night in order to attend to their business affairs; but from sunset to sunrise they were forbidden to follow the trade of huckster, to take articles in pawn, or in any way to traffic in gold or silver. During Holy Week, except during the hours of religious services, they were permitted to leave the ghetto on business, and to buy and sell with their shops half closed. From 1658 the Jews of Nice maintained but one synagogue, which, with the cemetery, was situated in the quarter of Limpia, near the city walls. The present synagogue, dedicated in 1886, is in the Rue Deloye. Among the native scholars of Nice may be cited: Mordecai ; Raphael ; Judah and Moses of Nice; Mordecai ben Israel Nizza; Eleazar Ḥayyim Nizza, who was rabbi of Padua about the year 1600; his son Isaiah, who settled in Venice in the seventeenth century; and Solomon ben Isaiah Nizza, author of various elegies and liturgical poems. The Jews of Nice, who in 1808 numbered 303, now (1904) number in a total population of 93,760 about 500. R. E. J. vi. 83, 88.